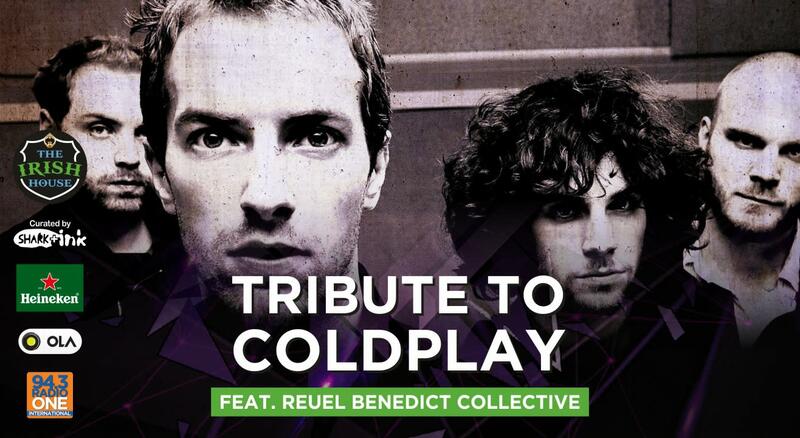 Gear up for a grand tour as Reuel Benedict Collective pays a fitting tribute to the iconic Coldplay as they travel across the nation covering some of the most legendary songs from the band at various Irish House locations. The Benedict Collective is a collaboration of Reuel Benedict, Adil Kurwa, Apurva Isac and Yohan Marshall. With Reuel on vocals, Adil on bass, Apurva on guitar and Yohan on the drums, it's bound to be a tribute that takes over your heart on a whole different level. The lead singer, Reuel Bendict, is also a songwriter, composer and producer. He is also the founder and music director at Eggs Benedict Productions. With a passion for music at an early age, he started working with his father, Vijay Benedict, famous playback singer at the age of 14. Since then he has come up with his own albums and worked with some of India's top musicians. The band arrives at The Irish House Whitefield on 28th September. The ticket gives you entry to the event at your selected location along with 1 free beer pint*. Get ready to groove to popular songs from the Coldplay like Yellow, The Scientist, Paradise, Fix You, Up & Up and many more. Book your spot for a memorable night with awesome music, chilled beer, great food and the Irish vibes.